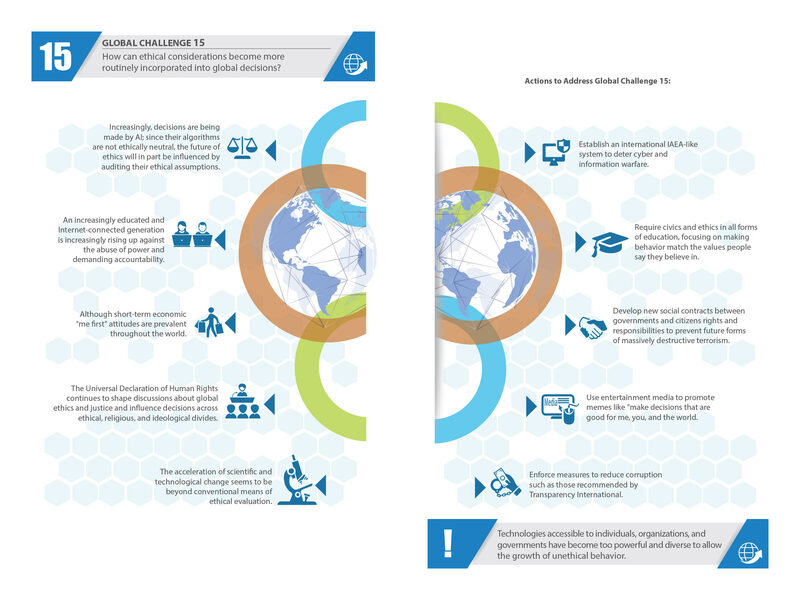 Global Challenge 15: How can ethical considerations become more routinely incorporated into global decisions? Increasingly, decisions are being made by AI; since their algorithms are not ethically neutral, the future of ethics will in part be influenced by auditing ethical assumptions in software. It will also be influenced by the flood of new information channels that are used to pollute and distort perceptions, leading many to rethink how to know the truth of global developments. Information warfare has been waged against national elections. Political spin masters drown out the pursuit of truth. We need to learn how to prevent or counter information warfare and fake news. At the same time, an increasingly educated and Internet-connected generation is increasingly rising up against the abuse of power and demanding accountability. The release of the Panama Papers in April 2016 exposed corruption worldwide. Surveillance implications of the IoT connected with AI could deter unethical decisionmaking. New technologies also make it easier for more people to do more good at a faster pace than ever before. The rising number of protests around the world shows a growing unwillingness to tolerate unethical decisionmaking by power elites. Although short-term economic “me-first” attitudes are prevalent throughout the world, love for humanity, solidarity, and global consciousness are also evident in the norms expressed in the many transnational political movements, inter-religious dialogues, UN organizations, international philanthropy, the Olympic spirit, refugee relief, development programs for poorer nations, NGOs like Doctors Without Borders, and international journalism. Global ethics are emerging around the world through the evolution of ISO standards and international treaties that are defining the norms of civilization. The Universal Declaration of Human Rights continues to shape discussions about global ethics and justice and to influence decisions across ethical, religious, and ideological divides. The International Criminal Court has indicted over 40 leaders, and the World Court has delivered 126 judgments between nation-states. Corporate social responsibility programs, ethical marketing, and social investing are increasing. The UN Global Compact is reinforcing ethics in business decisionmaking. However, corporate behavior can be less ethical in lower-income countries—for example, waste disposal and cigarette advertising. Corporate advanced marketing methods that bypass consumers’ deliberative capacities based on cognitive and behavioral sciences raise new questions of ethics. Transparency International’s 2016 Corruption Perceptions Index shows deterioration over the past several years; it found that over two-thirds of the 176 countries and territories assessed scored below 50 (on a scale from 0=highly corrupt to 100=very clean). The Global Slavery Index estimates that 45.8 million people were in some form of modern slavery in 2016 in 167 countries assessed and that 58% are in five countries (India, China, Pakistan, Bangladesh, and Uzbekistan); as a percent of population, however, the highest numbers are found in North Korea, Uzbekistan, Cambodia, India, and Qatar. Press freedom has been decreasing over the decade, and the global concentration of wealth has become obscene. The proliferation of unethical decisions that led to the 2008 financial crisis and 2009 global recession clearly demonstrate the interdependence of economic results and ethics. The moral will to act in collaboration across national, institutional, political, religious, and ideological boundaries that is necessary to address today’s global challenges requires global ethics. Public morality based on religious metaphysics is challenged daily by growing secularism, leaving many unsure about the moral basis for decisionmaking. Many turn back to old traditions for guidance, giving rise to fundamentalist movements in many religions today. Unfortunately, religions and ideologies that claim moral superiority give rise to “we-they” splits that are being played out in conflicts around the world. The acceleration of scientific and technological change seems to be beyond conventional means of ethical evaluation. Is it ethical to clone ourselves or bring dinosaurs back to life or to invent thousands of new life forms through synthetic biology? Since there is little time to assess daily S&T advances, is it time to invent anticipatory ethical systems? Just as law has a body of previous judgments to draw on for guidance, will we also need bodies of ethical judgments about possible future events? For example, in the foreseeable future it may be possible for individuals acting alone to make and deploy weapons of mass destruction. To prevent this possibility, will governments sacrifice citizen privacy? Will families and communities be more effective in nurturing more mentally healthy, moral people? Will public health and education systems create early detection and intervention strategies? The consequences of the failure to raise moral, mentally healthy people will be more serious in the future than in the past. Technologies accessible to individuals, organizations, and governments have become too powerful and diverse to allow the growth of unethical behavior. Create audit procedures to expose ethical assumptions in algorithms. Establish an international IAEA-like system to deter cyber and information warfare. Enforce measures to reduce corruption such as those recommended by Transparency International. Require civics and ethics in all forms of education, focusing on making behavior match the values people say they believe in. Promote parental guidance to establish a sense of values. Make ethics part of performance evaluation criteria. Develop new social contracts between governments and citizens’ rights and responsibilities to prevent future forms of massively destructive terrorism. Explore how transparency policies can be implemented. Revoke corrupt officials’ travel visas. Create better incentives for ethics in global decisions. Although short-term economic me-first attitudes are prevalent throughout the world, love for humanity and global consciousness are also evident in the norms expressed in the many UN treaties, UN organizations, international philanthropy, the Olympic spirit, inter-religious dialogues, refugee relief, development programs for poorer nations, doctors without borders, and international journalism. Heads of State and governments meet more often than ever before to improve the human condition. Human rights, transparency, and rule of law as policy criteria are relatively new in diplomatic history. But all this progress has been too slow. The rising number of protests around the world shows a growing unwillingness to tolerate unethical decisionmaking by power elites. An increasingly educated and Internet-connected generation is increasingly rising up against the abuse of power and demanding accountability. The proliferation of unethical decisions that led to the 2008 financial crisis clearly demonstrated the interdependence of economic results and ethics. Quick fixes avoided a global financial collapse and pulled the world out of recession, but the underlying ethical questions have not been addressed sufficiently to prevent future crises. The moral will to act in collaboration across national, institutional, religious, and ideological boundaries that is necessary to address today’s global challenges requires global ethics. Public morality based on religious metaphysics is challenged daily by growing secularism, leaving many unsure about the moral basis for decisionmaking. Many turn back to old traditions for guidance, giving rise to fundamentalist movements in many religions today. Unfortunately, religions and ideologies that claim moral superiority give rise to “we-they” splits that are being played out in conflicts around the world. The acceleration of scientific and technological change seems to grow beyond conventional means of ethical evaluation. Is it ethical to clone ourselves or bring dinosaurs back to life or to invent thousands of new life forms through synthetic biology? Is it ethical to implement new S&T developments without proper safety testing, or develop new forms of weapons without human control over their use and safe disposal? Should basic scientific research be pursued without direct regard for social issues and the society that funds it? Yet, social considerations might impair progress toward truthful understanding of reality. Since journalists have to “hype” to be read in such an information-noisy world, truth can be distorted, resulting in a cynical public. Since there is little time to assess daily S&T advances, is it time to invent anticipatory ethical systems? Just as law has a body of previous judgments to draw on for guidance, will we also need bodies of ethical judgments about possible future events? 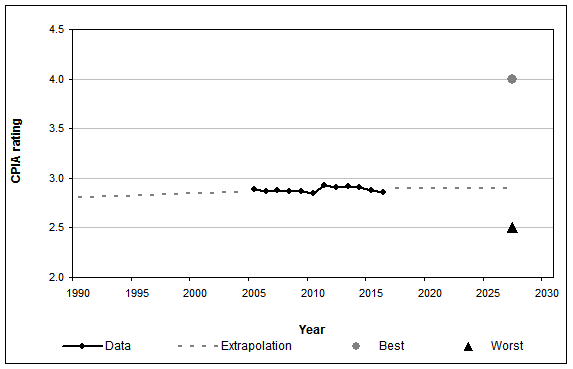 Despite the extraordinary achievements in S&T, future risks from the continued acceleration and globalization remain (See GFIS Future S&T Management and Policy Issues)and give rise to future ethical issues (see GFIS Future Ethical Issues, also under Research in GFIS). For example, it is possible that one day a single individual could make and deploy a bioweapon of mass destruction. Society will naturally want to prevent this, requiring early detection and probably invasion of privacy and abridgment of other civil rights. To reduce the number of such potentially massively destructive people in the future, healthy psychological development of all children should be the concern of everyone. Such observations are not new, but the consequences of failure to nurture mentally healthy, moral people may be much more serious in the future than they were in the past. If individuals can be identified who are very likely to commit or who are preparing acts of mass terrorism, is it ethical to arrest them before the act? The Snowden-NSA revelations give rise to a global discussion of individual and sovereign rights versus collective security. The ethical grounds of using advanced surveillance technologies on the public and political protesters are also questioned. At the same time, new technologies also make it easier for more people to do more good at a faster pace than ever before. Single individuals initiate groups on the Internet, organizing actions worldwide around specific ethical issues. News media, blogs, mobile phone cameras, ethics commissions, and NGOs are increasingly exposing unethical decisions and corrupt practices. It is quite likely that the vast majority of decisions every day around the world are perfectly honorable. Collective responsibility for global ethics in decisionmaking is embryonic but growing. Bill Gates and Warren Buffet have recruited 128 billionaires to give the majority of their money to philanthropic causes. Elon Musk is freely sharing patents to accelerate development of greener technologies. Richard Branson has created Plan B for businesses to make decisions for people, planet, and profit, but not just for profit. Corporate social responsibility programs, ethical marketing, and social investing are increasing. The UN Global Compact was created to reinforce ethics in business decisionmaking. As of April 2015 it had more than 12,000 participants with 145 countries, 8322 businesses, and over 4608 civil society organizations, while some 5628 businesses have been expelled for failing to report progress on meeting the Compact’s goals. It has improved business-NGO collaboration, raised the profile of corporate responsibility programs, increased businesses’ non-financial reporting mandates in many countries, and created a 2014–16 strategy to further businesses’ ethical roles in peace and development. Global ethics also are emerging around the world through the evolution of ISO standards and international treaties that are defining the norms of civilization. The Universal Declaration of Human Rights continues to shape discussions about global ethics and decisions across religious and ideological divides. Despite the progress made, corruption remains prevalent throughout the world, and a serious impediment to development. Nearly 20% of 130,000 firms surveyed by the World Bank in 135 countries were requested to pay a bribe at least once per year. Bribery estimates range from $1 trillion to 1.6 trillion worldwide. Transparency International’s 2014 Corruption Perceptions Index results found that 68% of the 175 countries and territories assessed scored below 50 (on a scale from 0=highly corrupt to 100=very clean). The percent of countries in each region scored under 50 were: Americas (68); Asia Pacific (64), Eastern and Central Europe (95); EU and Western Europe (16); Middle East and North Africa (84), Sub-Saharan Africa (92); and the world average was 43%. Their 2015 Defense Companies Anti-Corruption Index found 33% of the companies studied had improved their ethics and anti-corruption programs since 2012. There are approximately 10.5 million children ages 5–14 working in hazardous and oftentimes slavery-like conditions, with 71% of those being young girls. Between 12 million and 29.8 million people are slaves today, more than at the height of the nineteenth-century slave trade; organized crime takes in over $3 trillion annually; and rich countries send some 50 million tons of waste to developing countries each year. Concentration of personal wealth is increasing (the richest 10% own 86% of global wealth) as is technological unemployment, which brings into question the ethics of the current political-economic systems. The Extractive Industries Transparency Initiative, backed by the World Bank, was launched in 2002 to obligate companies and countries to make public the terms of oil, gas, and mineral deals with developing countries; it now has 31 compliant countries and 38 members have publish revenues. The UN Convention Against Corruption has been ratified by 175 countries and the European Union. This established definitions and rules of behavior and is the only legally binding universal anti-corruption instrument. The International Criminal Court is successfully trying political leaders, and the proceedings are Web-cast. The UN’s on-line Universal Human Rights Index compiles recommendations and country reports for public comparisons. UNESCO’s study of world religions to find a “Common Framework for the Ethics of the 21st Century” should be used as a basis to engage inter-religious dialog leaders, other thought leaders, and the international media to increase global ethical considerations in decisionmaing. Corrupt official’s travel visa should be banned, Transparency’s “Unmask the Corrupt” campaign should be supported, and owners of all companies should be publically registered. We need to create better incentives for ethics in global decisions, promote parental guidance to establish a sense of values, teach ethics and solidarity principles in schools, encourage respect for legitimate authority while demanding accountability, support the identification and success of the influence of role models, implement cost-effective strategies for global education for a more enlightened world, and make behavior match the values people say they believe in. Too often business is a way to make money by cheating people instead of solving problems. Entertainment media could promote memes like “make decisions that are good for me, you, and the world.” Ethical and spiritual education should grow in balance with the new powers given to humanity by technological progress. Sub-Saharan Africa: About 5% of African youth go to universities today and are likely to be the next generation of African leaders. How much they care about their ethical development could predict the future ethics of the continent. South Africa has launched the Five Plus Project to get richer South Africans to give at least 5% of their income to help reduce poverty. Since African citizens do not always share in the benefits of their natural resources, the Extractive Industries Transparency Initiative is working to let the public know how their national natural resources are being used—and by whom and at what price. Special attention will have to be given to millions of AIDS orphans in Africa who have had little choice about growing up in unethical environments. The proportion of children engaged in child labor in sub-Saharan Africa is currently around 25%. Corruption in the region is estimated at $150 billion (more than the entire amount of ODA); this remains a serious impediment to democracy and economic development in many African countries. However, bribery varies across Africa; 63% of those surveyed in Sierra Leone reported paying bribes (down from 84% several years ago) while only 4% in Botswana reported this. The Business Ethics Network of Africa continues to grow (10 Sub-Sharan and 6 North African countries patriciate), with conferences, research, and publications. Transparency International has 16 National Chapters, 5 National Chapters in Formation and 6 National Contacts in Sub-Saharan Africa helping to build capacity to counter corruption. Middle East and North Africa: What are the global ethics of intervention? Scholars should draw lessons about the ethical implications of intervention and decisionmaking on all sides of the Syrian disasters. Much of the original Arab Spring/Awaking protests were calls for ethics in decisionmaking. With youth unemployment at 25% of the region’s population, increasing crime and another forms of unethical activity it is likely. According to Bayt.com surveys corporate social responsibility is growing in the Middle East and North Africa. This may build on Zakat (charitable giving), one of the five requirements in Islam. Asia and Oceania: UNESCO organized the first Asia-Pacific conference on “Ethics Education for All: Searching for a New Paradigm of Learning to Live Together,” which focused on global justice, curriculum and future trends in ethics education. Altering the genome of embryos by Chinese scientists raises the ethics of one generation changing the genetics for all future generations. The millions of dollars that flooded the Philippines to help it recover from Typhoon Haiyan led to corruption, reminding us to include financial accountability and transparency in natural disaster resilience planning. As China’s global decisionmaking role increases, it will face traditional versus Western value conflicts. It has initiated a major anticorruption campaign and if successful could influence others in the region. Some believe the rate of urbanization and economic growth is so fast in Asia that it is difficult to consider global ethics, while some Asians do not believe there are common global ethics and maintain that the pursuit to create them is a Western notion. Europe: The growing immigrant population in Europe will increase discussions of ethics and identity for Europe. Most euro-zone countries are ranked among the world’s least corrupt by Transparency International; however, it ranks Eastern Europe and Central Asia among the most corrupt in the world. The EU Anti-Corruption Report, to be published every two years, has been set to assess and help member states’ efforts to address corruption. The first report, published in 2014, shows that 76% of the Europeans participating in the Eurobarometer survey think that corruption is widespread in their own country, with ratings ranging from 20% in Denmark to 99% in Greece and 97% in Italy. The financial crisis involving Greece and other Southern European countries raises moral issues about the interdependent ethical responsibilities among citizens, the state, and members of the eurozone. The European Ethics Network is linking efforts to improve ethical decisionmaking, while Ethics Enterprise is working to mobilize an international network of ethicists and to organize innovative actions to attract attention for ethics in business. Spain and France have the greatest number of businesses in the UN Global Compact, and Spain is also the leading country in ISO 50001 energy management compliance. Latin America: Economic benefits of rapid exploitation of naturalresources are at odds with environmental ethics across the region. Chile’s President vowed to counter corruption as a top priority for her new government. Mexico has passed legislation to create a national anti-corruption system and enacted an Anti-corruption Federal Law on public procurement to punish individuals and companies for unethical behavior. Problems such as lack of personal security, limited access to education and health services, lack of faith in politics, badly damaged institutions that do not fulfill their role (such as the justice system and police), and the accelerated environmental degradation in some countries are aspects of a serious lack of ethical values. Regardless of legal frameworks, large sections of the population remain excluded from the promised protections. It also manifests as a serious lack of ethical standards in the mass media. North America: With 5% of the world’s population, the US has 25% of those in jail, and 50% of the world’s miliary budgets. US Defense research has created cyborg insects that can be remotely controlled raising new questions for the future of inter-species cyborg ethics. Because technologies of national security intelligence and their applications could evolve faster than public understanding and political oversight, the US and others have begun to fundamentally rethink security and privacy requirements. What are the ethical ways to identify and stop individuals who are planning to make and deploy weapons of mass destruction? How far can business go to counter cyber espionage? Will a continually advancing “Internet of Things” with sensor networks and drones make privacy an illusion and hence replace covert methods? Although the U.S. has provided some leadership in bringing ethical considerations into many international organizations and forums, its ethical leadership is compromised by lobbying interests; the U.S. Supreme Court ruled that new systems can allow anyone (including organized crime and foreign political sources) to donate any amount of money anonymously to special funds that could influence political media campaigns. There is still no generally accepted way to get corrupting money out of politics and elections or to stop “cozy relationships” between regulators and those they regulate. There is public dissatisfaction with the status and speed of prosecutions of individuals’ and companies’ unethical financial practices that lead to the 2008 financial crisis. The U.S. plans to adopt legislation to make it compliant with the Extractive Industries Transparency Initiative. Although ranked among the top best countries by the Corruption Perceptions Index, Canada has been shaken by several incidents of corruption and abuse of public office, which undermines citizens’ trust in government officials.